A little over a week ago, a dear friend of mine passed away. He was a good man with the faux-surliness of a scientist that he used to mask what was quite possibly the sentimental heart of a poet. When I came to California, he took me under his wing, teaching me the ins and outs of my new job at a new school. For years, the husband and I celebrated Canadian Thanksgiving with him, his wife, and other dear friends. On those thanksgivings in a condo up Clarewood Lane, the Canadian flag would hang outside the front door limply (it was never very windy) but proudly. Before dinner, there would be a standing rendition of the Canadian national anthem, with many of us just mouthing the words we didn't entirely know even though they were printed on cheat sheets for us. Usually at some point, he would switch to the French and then chastise us more for not knowing those lyrics. Once we settled into our chairs, he and his wife would serve the requisite turkey and mashed potatoes with Canadian flair, including the tightly-wound treble clefs of fern fronds and the deep indigo of blueberry pie, on blue and white china featuring the main buildings of Cal's campus (he and his wife, proud alums). Spouses were never allowed to sit next to each other, and it was often hard to hear what your neighbor was saying because someone was often telling a bawdy and raucous story resulting in loud laughter. Dinner was followed by brandy at the table until someone reluctantly got up, seeing as many of us had to teach the next day. It was cancer. Some tight fist in his own body that grew soon enough that it took over. In the end, he was eating foie gras and chocolate in a rush of what little enjoyment there was to be had in food after having denied himself such luxuries following his heart attack some years before. Might as well. He died one Thursday morning. I miss him. In his honor, we have done three things. 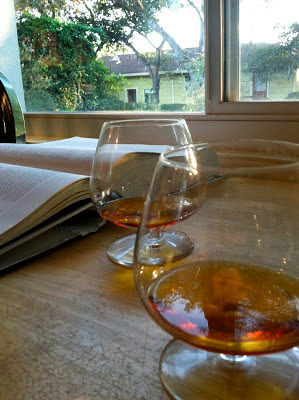 When the husband and I got married (on the weekend of Canadian Thanksgiving no less), we were gifted one of the last remaining bottles of our dear friend's favorite thanksgiving brandy and a set of beautiful snifters. We toasted our friend as we drank the last of the brandy. Then we sat down to eat one of the most delectable blueberry pies--even if we didn't wait long enough to let the filling set and it pooled around the most divine crust. Finally, I read a poem from Coney Island of the Mind, a book that this scientist said changed everything he knew about the world when he was a young man. Like I said, a poet beneath that exterior of logic and rationality. I give you the poem and the blueberry pie. Both testaments to this good man. 1. Process the flour, salt, and sugar in a food processor until combined. Add the shortening and process until the mixture has the texture of coarse sand, about 10 seconds. Scatter the butter pieces over the flour mixture: cut the butter into the flour until the mixture is pale yellow and resembles course crumbs, with butter bit no larger than small peas, about ten 1-second pulses. Turn the mixture into a medium bowl. 2. Sprinkle 6 tablespoons of the ice water over the mixture. 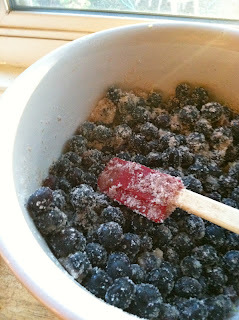 With a rubber spatula, use a folding motion to mix. Press down on the dough with the broad side of the spatula until the dough sticks together, adding up to 2 tablespoons more ice water if the dough will not come together. Divide the dough into 2 balls and flatten each into a 4-inch disk. Wrap each in plastic and refrigerate at least 1 hour or up to 2 days before rolling. 1. Adjust an oven rack to the lowest position, place a rimmed baking sheet on it, and heat the oven to 500 degrees. 2. Roll out the dough on a lightly flours work surface to a 12-inch circle. Transfer the dough to a 9-inch pie plate. Working around the circumference of the pan, ease the dough into the pan corners. Leave the dough that overhangs the lip of the pie plate in place; refrigerate the dough-lined pie plate. 3. Toss the berries, sugar (amount depending on how sweet the berries are and how sweet you like your pie), lemon juice and zest, spices, and tapioca in a medium bowl. Let stand 15 minutes. 4. Roll out the second piece of dough to a 12-inch circle. 5. 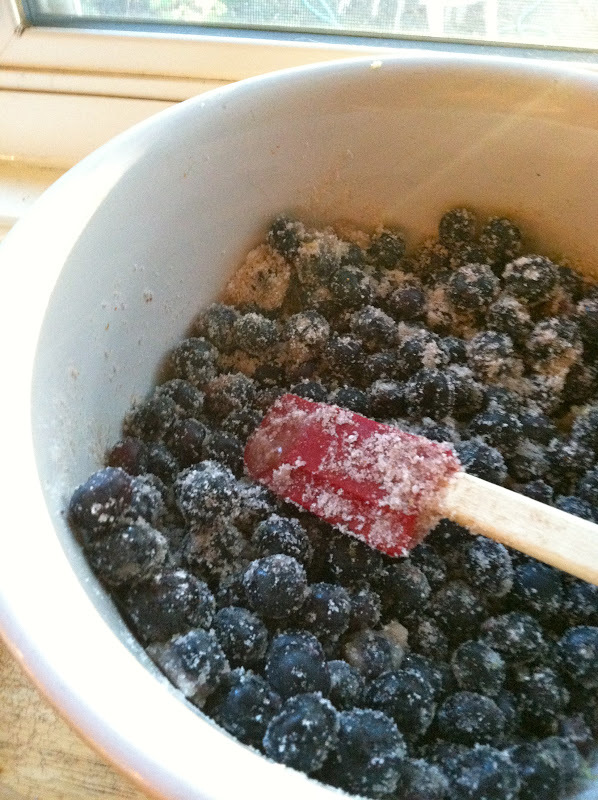 Spoon the berries into the pie shell in the pie plate and scatter the butter pieces over the filling. Place the second piece of dough over the filling. Trim the top and bottom edges to 1/2 inch beyond the pan lip. Tuck the rim of the dough underneath itself or pinch the two edges together. Cut four slits into the dough top. If the pie dough is very soft, place in the freezer for 10 minutes. Brush the egg white on the top of the crust and sprinkle evenly with the remaining 1 tablespoon of sugar. 6. Place the pie on the baking sheet and lower the oven temperature to 425 degrees. Bake until the top crust is golden, about 25 minutes. Rotate the pie and reduce the oven temperature to 375 degrees; continue baking into the juices bubble and the crust is a deep golden-brown, about 30-35 minutes longer. 7. Transfer the pie to a wire rack. Cool to room temperature, which is much longer than you think. And it's worth it to wait (which we did not do) because then the innards are more solidified. However, it is just as tasty still warm and oozing all over the place. Just not as pretty. If you can swing it, let this puppy sit over night.